One of the great architectural achievements of the 20th century, Frank Lloyd Wright’s 1959 spiral design alone would make this museum a must. 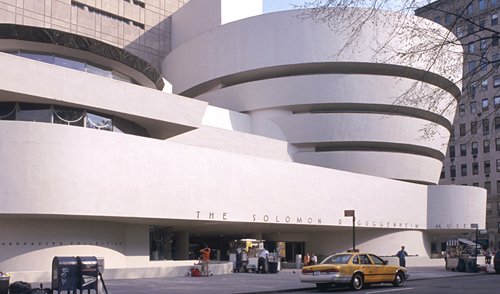 Solomon Guggenheim’s core collection of Abstract art has been widened by donations of several important collections. The museum owns a host of work by Brancusi, Calder, Klee, Chagall, Miró, Leger, Mondrian, Picasso, Oldenberg, and Rauschenberg. Only a small portion, changed periodically, is displayed, as the main gallery is used for temporary exhibits. Sections of the Thannhauser collection, which includes masterpieces by Cézanne, Gauguin, van Gogh, and Picasso, are always on view. The Guggenheim has the largest collection of Kandinsky’s works in the U.S. The Kandinsky Gallery contains permanent displays. Adults $18, students and seniors (with valid ID) $15, children under 12 and members free, 5:45–7:45pm Fri donation only. The café on the main floor is a good spot to rest your feet. The best way to see the museum is to take the elevator to the skylighted top and wind your way back down. Free audio tours cover Frank Lloyd Wright architecture and the permanent collection. There is a regular daily program of interpretive tours. Check the main desk for current schedules. Picasso’s early paintings showed sympathy for the working class. This striking 1904 canvas uses angular contours and a bleak palette of whites and grays to make the subject a symbol of the misfortunes of the poor. In this memorable portrait from 1931, Picasso portrays the supple body and golden tresses of his mistress, Marie-Thérèse, one of his favorite subjects. He employed the continuous arched line from forehead to nose that he would often repeat in the many paintings of his young muse. Van Gogh was recovering from an attack of mental distress when he painted this scene in July 1889, one year before his suicide. The subject was the low range of the Alpilles mountains in southern France, visible from his hospital grounds. The bold brush strokes are characteristic of van Gogh’s later work. Edouard Manet scandalized Paris with his paintings of prostitutes and courtesans. This private scene is of a partially undressed woman, an actress perhaps, contemplating her image. Gauguin made his first trip to Tahiti in 1891 in search of a paradise untainted by Western culture. This idyllic village landscape was painted during that trip; the rich hues and flattened forms show the simplicity he sought. The phrase “Haere Mai,” (“Come Here”) is painted into the left corner. Paul Cézanne’s later style, based on the interplay of surface and depth, is shown in this 1877 painting. His mastery of space and depth, as seen in the mottled apples in the foreground, make him the foremost precursor of Cubism. In Bibémus, the abandoned quarries outside Aix-en-Province, France, Cézanne found a manmade landscape that suited his increasingly geometric style. He painted many variations of this scene from 1895–9. This unsentimental rendering of the village where Pisarro lived on and off from 1866–83 emphasizes the use of light and shade. The depiction of villagers was thought vulgar by some painters of the day. Kandinsky wanted the undulating, richly-colored ovals and animated black brushstrokes to elicit specific reactions from viewers. Black Lines (1913) is one of his best-known non-objective works. Painted after Chagall moved to Paris from Russia in 1910, the scene reflects the latest avant garde styles. The Eiffel Tower seen in the distance is a metaphor for Paris and for modernity.